Young musician Wilson Hsu could not be more excited for his upcoming trip to Asia. 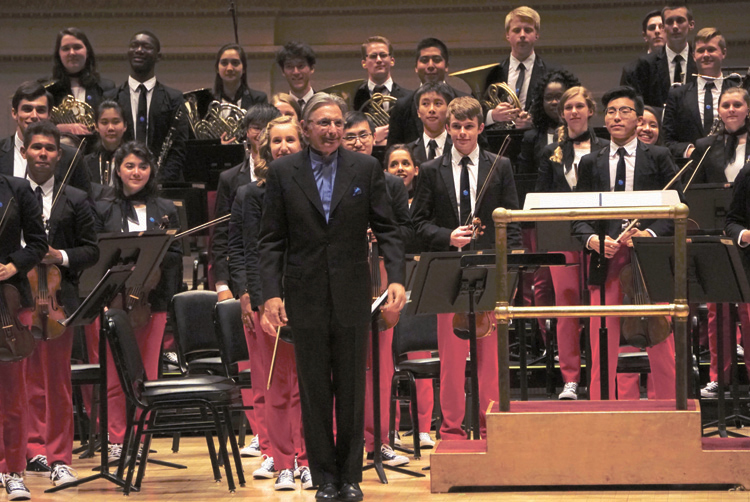 This summer, the National Youth Orchestra of the United States of America (NYO-USA), featuring 106 musicians from across the US, comes together for its sixth year of music-making. On July 19, the orchestra kicked off its Asia tour with a debut concert at Carnegie Hall in New York, which will be followed by return visits to Beijing and Shanghai and debuts in Taipei, Seoul, and Daejeon from July 24 through Aug 3. "I've never played in China before, this is going to be my first time," Hsu, an 18-year-old violist, told China Daily backstage at Carnegie Hall after the debut concert. "I think it's so exciting being a Chinese person to go back to Asia, to share the music that I've learned in the states," said Hsu, from Brookline, Massachusetts, whose parents are from Taiwan. The orchestra is headed to Asia with conductor Michael Tilson Thomas and pianist Jean-Yves Thibaudet and will perform a new Carnegie Hall-commissioned work by Ted Hearne alongside works by Sibelius and Gershwin. The members of the 2018 orchestra range in age from 16 to 19 and come from 28 US states and Puerto Rico. All of them have been recognized by Carnegie Hall as being among the finest young musicians in the country, following a comprehensive and highly competitive audition process. "The musicians who make up NYO-USA's 2018 roster are among the very best players in the nation. This promises to be an unforgettable summer of new discoveries for them, offering opportunities to present extraordinary performances around the world and to serve as wonderful musical ambassadors for their country," said Clive Gillinson, Carnegie Hall's executive and artistic director. Among this year's members, 36 are returning from previous years. "Playing music as a group of young musicians, there is a sense of camaraderie and emotional connection that can only be found through the creating of this type of art together that really drew us back," said Alexander Wu, a cellist who has returned to the NYO-USA. The concert program that was performed at Carnegie Hall and will be performed at all tour venues in Asia includes Gershwin's Piano Concerto in F Major featuring Thibaudet and Sibelius's Symphony No. 2. It also features the premiere of Brass Tacks by American composer Ted Hearne, a new work specially commissioned for NYO-USA, described by Hearne as "a noisy dance, playful and ferocious, inspired by "trap" music and the rhythmic energy and dance culture of the hip-hop music of the American South." Following the Carnegie Hall concert, NYO-USA returns to Asia with performances at the Taipei National Concert Hall (July 24), Shanghai Symphony Hall (July 27), the National Centre for the Performing Arts in Beijing (July 29), Lotte Concert Hall in Seoul (Aug 1) and Daejeon Arts Center (Aug 3). As part of their travel schedule, the young musicians will have the opportunity to tour each city they visit, meet and collaborate with local young musicians and experience the richness of Asian culture.